Proven in thousands of demanding applications around the world. NAIAD thrusters offer so much more than typical thrusters. Highly skewed seven-blade stainless steel propeller for quiet, highly efficient performance. Highest quality materials and workmanship throughout. Each unit rigorously tested under full load. Handsome compact reservoir modules with integral manifolds eliminate loose components and their interconnecting piping. Experience base of several thousand units. Guaranteed leak-proof, click below to find out why. Available in five sizes and seven power levels, the NAIAD In Line Bow Thruster and In-Line Stern Thruster is an extraordinarily compact unit with high output relative to its tunnel diameter. A unique feature of this design is the highly skewed 7 blade propeller offering maximum thrust and extremely quiet operation. 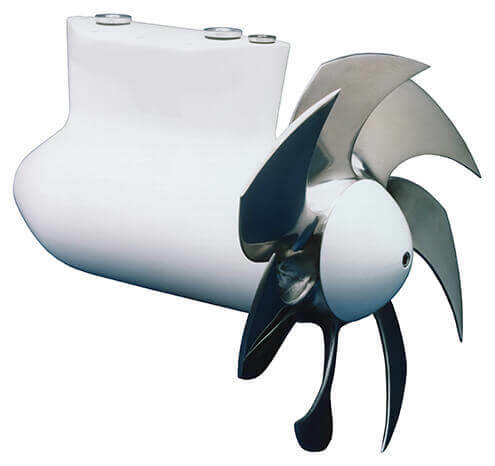 The thruster housing, propeller and shafting are precision manufactured in AISI 316 Stainless Steel for the highest in marine corrosion resistance. The working pressure region of In-Line Bow Thrusters and In-Line Stern Thrusters assembly is isolated from the dual seawater shaft seals to eliminate concerns of hydraulic oil leakage into the environment. In addition, the seawater shaft seal cavity is protected from system oil leakage by a unique drain pressure control assembly, which vents any oil leakage to a controlled onboard path. NAIAD Power In-Line Thrusters are CNC manufactured in-house and tested under load on our unique hydraulic dynamometer. More importantly, NAIAD In-Line Thruster Systems have been proven in thousands of demanding applications around the world. NAIAD In‐Line Thrusters are CNC manufactured in‐house and each unit is tested under full load on our unique hydraulic dynamometer. More importantly, NAIAD In‐Line Thrusters have been field proven in thousands of demanding applications worldwide. The pressurised region of the In‐Line Thruster assembly is isolated from the dual seawater shaft seals to eliminate concerns of hydraulic oil leakage into the environment. The seawater shaft seal cavity is protected from oil leakage by a unique drain pressure control assembly which vents any oil leakage to a controlled outboard path. Naiad’s high‐efficiency hydraulic reservoir assemblies are engineered to be extraordinarily compact (less space and weight) due to a unique internal baffling system. System interconnections such as hydraulic fluid supply, filtration, and cooling are conveniently located for easy installation and service. Unlike less sophisticated systems, our proven hydraulic control manifold assemblies are designed, manufactured and tested in our own state‐of‐the‐art facility and include all necessary valves for easy installation with less plumbing. Naiad manifolds save installation labour and have significantly fewer hydraulic interconnections and potential leak points.